On Friday April 12 I flew out to Lisbon (through Barcelona) to meet Mom and Dad who has come through Amsterdam a day early because of blizzards in the US. Mehra happened to be on the same flight as them so we all met up at the Lisbon airport and took a cab to the Airbnb. It was super nice- 2 bathrooms, 2 bedrooms (King and two twins), kitchen and living room. (Our room with the twin beds). On our way to dinner at Cabacas with Uncle Thomas from Germany, we stopped at tourist information to get Lisboa cards (~€15-20 per day, making most of the transportation and sites free to visit). For dinner was typical Portuguese food- seafood heavy, especially cod. After dinner, we had some of the best gelato I’ve had in Europe so far at Sorbettini. (I tried dulce de leche, salted caramel and chocolate). Then, back to the hotel to sleep. In the morning we made our way to the Oceanario, one of the best aquariums in the world. Next stop, lunch. More Portuguese food (although most of us tried to stay away from fish after the aquarium..) so I had a burger and others had salads or octopus or something else. Then, the famous Tile Museum. Portugal is known for azulejo, normally blue and white but can be any color tiles hand painted, usually to form scenes or people, etc. Many of the houses are covered in them not just for easy decoration but also because they are fireproof (something people were worried about after the fall of Lisbon due to the combined earthquake, tsunami, and fire (all due to the tectonic plates shifting- the fire was caused by candles falling). Now, while talking about tiles, let’s take a moment to morn for the horrible renditions of animals as shown below. (Don’t worry there were many more). We went next to the main square next to the waterfront (common misconception- this is actually a river in Lisboa, not the ocean) called Praça do Comércio. The arch, Arco da Rua Augusta, has stairs inside so we went up for a great view of the city. Bonus points for rubbing the feet (or really baby toes) of the large statue on top- it’s supposed to bring good luck. For dinner we went to Thomas’ favorite restaurant, Le Petite Café. I had some decent duck served on potatoes before a chocolate mousse. The monastery of San Jerónimo. Monument for explorers (aka conquers, killers, whichever name you prefer). Portable trunk cot, the original sofa bed. An actual good rendition of dogs- in the dog room of the palace. Afterwards we went to the LX Factory, an artsy district of shops and had amazing cheesecake. We slept in and then did a food tour with a charismatic tour guide. Starting with sardines we also had, among other things, cod pancakes, chorizo, ham, cheese and quince fruit jelly (my favorite thing here), bean cakes and pastel de nata. After taking a 3 hour train up, we started a private tour in a car. It was pouring so we were glad to see the whole town while kept dry. Super amazing tuna steak (rather than canned tuna it’s a fillet) with mushrooms. GF chocolate and strawberry pancakes. On Friday we went to the airport to leave. I also found out that the horrible doctor I had in Barcelona was fired (I got a nice letter from the hospital after filing a report). My tutoree (an older Spanish man who wants to learn English to translate music from Spanish to English) referred me to his friend so I started teaching each of them 2x a week for an hour each. On Wednesday I woke up early to meet with my program directors for a mid semester check-in, but because I signed up in London, the time got messed up so I was up for nothing. Luckily, I got to wake up early again on Friday to come back. The director was impressed with how much my Spanish has improved and although many of my classes are, um, sub-Swarthmore level shall we say (I’m okay with having less homework, but would love to have classes, like business, teach me about things like business, but I digress…) The good thing was my goal in coming here was to improve my Spanish, which is happening, and I realize how lucky I am to be at a place like Swat where classes are so interesting and profound and I learn a lot. I’ve also, obviously, done a lot of traveling throughout Europe which is a lot easier from Europe than the US, met a lot of people, love my host family, and am taking classes (however superficial) about things that I couldn’t at Swat (like business and marketing). Friday we had make-up classes (because when we get class off one week, we have an extra day the next week). After class I went with another girl in my class and a few of our friends from Spain to the U21 Spain soccer team in Granada (we won 1-0) which was fun. My host brother (who is apparently the “best soccer player” and “only isn’t on Real Madrid because he is too young”) was jealous but he had to go to bed. Saturday was a guided tour of a park and more talk about Federico Garcia Lorca (they’re obsessed with him here). He was a Spanish playwright who is widely known. I’ve read a few of his works, including La casa de Bernarda Alba, which we saw acted out here. My host parents told me it likely wasn’t worth going, plus I was tired from my two-day early wake-up, so I slept in, went swimming, met up with friends from my program at a cafe to do work, and then went out with friends from my business class. Noah’s flight was supposed to get in at 9:30 to Granada on Sunday but the first flight to Madrid got delayed by over 3 hours, so he didn’t get here until 1:30 or so. I picked him up from the airport (because its excessively confusing to get there and come back, especially because it is so far from the city center). We checked into the language school he enrolled at while here, the bottom part of which is classrooms and the top part of which is apartments. While I stuck to cod to eat, Noah had croquetas and Ox tail. On Monday he started class around when I have class. I went home for lunch and tutored before we met up with two of my friends to walk into the old district (el Albaicin) and eat snails. On Tuesday after class I tutored again and cooked GF pasta with this amazing Parmesan tomato sauce. I also got membrillo (quince jelly) and soft cheese, my favorite thing here, along with strawberries. I met with the doctor to get my MRI results before going to a vegan restaurant with a vegan friend of mine and Noah. So I still can’t do any weight lifting or exercise besides walking with my back pain, especially not until my MRI this coming Monday. So I decided to go swimming as my doctor recommended. Right as I was about to start changing into my swimsuit I heard my name… being called by one of my professors… We ride the same bus sometimes home from class so I should have figured the same pool would be close, but that was sufficiently awkward. Luckily she felt the same way since she brought it up that way in class. The pain was a lot better in my back but I had to stop taking the ibuprofen because of the heartburn it was giving me, which meant in London it hurt quite a bit more. That, along with the Airbnb being a bit further than we were expecting, and there being nowhere in the club to sit made things a little worse, but nothing that a heating pad and some rest and stretching can’t overcome. I got into London (via the very large 3 gate Granada airport) on Thursday at around 9:00 after classes. I was going to sleep but happened to be surrounded by babies on all sides, many of whom would not be convinced to calm down, despite what the parents tried. The next morning we woke up at met at a cute tea place near Buckingham called The English Rose. They had Gf scones and delicious tea and vegan tea cakes for Belle (egg allergy). We walked around the area which, surprisingly had a lot of the major London sights. Big Ben was under renovation but we saw one clock face. Westminster we were supposed to be able to go into the church without paying for the whole tour but the time we got there they said we had to wait an hour so we left without doing that but the outside was impressive. We saw the London Eye (Ferris wheel thing) from the ground (yay shared fear of heights) and, also from outside, the Admiralty House, Houses of Parliament, St. James Gardens, and Piccadilly Circus (basically a square with large screens, like a very small, watered down NYC Times Square). We had Mexican for lunch because I hadn’t had it since I’d gotten to Europe. The enchiladas and taquitos were amazing, as was having sour cream again. Afterwards, we went into the (hugeee) National Gallery and National Portrait Gallery (both free and probably my favorite museums so far). Mehra and two of her abroad friends flew in and met us and we walked around and went to a small cafe for pie and tea. Belle, Ley, and I went to Coven Garden (a indoor and outdoor mall and group of stores and restaurants) and got chocolate and looked at other things while the others went off on their own. We met back up at an Italian place with GF and vegan options (Bella Italia) for dinner and to celebrate Ley’s 21st birthday. We got her a headband and chocolates, dinner and cupcakes (and obviously our presence). After delicious GF penne with a mushroom, spinach white sauce and a GF red velvet cupcake for me, we made our way to our first (and only) pub in London (and no rugby was on so perhaps we were cheated of the real experience) where we talked with an older couple that we shared a table with. Finally, tired, we made our way back to the Airbnb and fell asleep. The next day, we made our way to Flock, a cafe near the Tower of London and the London Bridge. Tea, of course, for all. “English breakfast” of beans, eggs, ham, bacon and mushrooms for me. The day was a lot colder, grayer, windier, but we braved it and walked around the old tower and over the Bridge. We made our way to Oxford Street (a main shopping street) and I got GF brownies and more tea as we met some of Belle’s family friends. Next was Kensington Gardens and Palace. We saw where Meghan and Harry announced their engagement, where the royal family lives (unfortunately only from the outside) and different embassies for multiple countries. For lunch, one of the highlights of the trip, we had high tea at the cafe in Kensington as well. GF tea sandwiches and scones with clotted cream and jam and three little gf pastries- lemon and chocolate and chocolate chip, along with Earl Gray with Blue Flowers tea which was amazing. After tea we took the tube back to the Airbnb and napped/rested before rallying to go to Cereal Killer Cafe whose menu consists only of cereal type products — milkshakes or ice cream from cereal, cereal with toppings or milks, etc. Next, we went to Tiger Tiger, a club that was hosting a St. Patrick’s Day Night (kind of an oxymoron I suppose). We got back late, after getting Five Guys Fries, especially with the tube ride being between 30-60 minutes. A few hours later, we got up to check out of the Airbnb where Belle and I said goodbye to the others and got breakfast at a cafe (cheese omelet and more tea for me) before I got the train to head to the airport. One thing that was really smart was that they let you check your carryon at check in for free. Less cool was that apparently peanut butter (which they don’t sell in Spain) is considered a liquid and was confiscated. Also not horrible but not ideal is that many major airports in Spain don’t post the gate until 30 minutes before boarding. Luckily I used that time to get peanut butter cups (also not sold in Spain) and buy my bus ticket from Malaga to Granada (since we were flying into Malaga and I had to take a 2 hour bus to get back to Granada, the payment for which hadn’t been going through). The bus to Granada got in a half an hour early which was really nice and a great way to start the new week. Thursday February 28- We had Thursday off of classes because of the Day of Andalucía (the region encompassing Granada) so we woke up at 6:00 to catch an early flight to Barcelona (all 20 or so of us in the program). At first, I surprised myself by being packed and ready minutes before I had planned, despite the sleep-deprecation blur. But as soon as I got out to the bus stop in front of my house, I realized it was not nearly enough. Due to the holiday, most likely, it wasn’t running until about an hour later. And I was a 25 minute walk from the connecting airport bus… which left in 10-15 minutes. I would also like to preface this by saying the distance from the center also manifests itself in a lack of taxis… so either way I had to make it up, in good time. The difference would be if I had to pay €30 or €3. So, it’s before 7 am, relatively dark, the only people out are those coming back from a night out. And I’m jogging down the sidewalk with my duffel and backpack watching the minutes tick by and realizing, as the sweat starts accumulating on my lower back, that there is no way I’m going to make it. So I start walking for about 5 minutes, still not to the city center, when a green beacon of hope turns the corner. I flag down the taxi and stumble in, eliciting a rather strange (and deserved) look from the taxi driver. And end up at the airport 20 minutes before everyone else, super glad I ran and sweated and stressed (not). Then, to make things better, our flight was delayed 2 hours. The airline was nice enough to give us a voucher for some food, but it was hard to think that we could have slept in a lot longer had we known. Finally in Barcelona, the University held a short lecture for us on Cataluña independence before a Swarthmore professor took the three of us from Swat in the program out to lunch along with another girl who was studying in Barcelona (also from Swat). Afterwards we walked around, in vintage stores and a market that had cute chocolates and fruit and other things. Next, we joined with the Barcelona students (different branch of the same abroad program) and got tapas and ice cream together before (finally) bedtime. The only problem was my lingering back discomfort morphed into full on pain, making it hard for me to sit down, walk, or stand up. Friday March 1- The breakfast buffet was probably one of the best I’ve ever had. From ripe, juicy pears to eggs to chocolate croissants (not for me, obviously 😦 ), there was so much to eat and all of it amazing. But… I was at the point where my roommate had to help me stand up and sit down and I couldn’t go for very long without needing to be horizontal. So I went to the Farmacia (which is cool because pharmacists in Spain act a lot like doctors except for things like antibiotics, injections, etc) and they said to try a pain cream, pain meds, and a heating pad. So I put all these things to use and stayed in the hotel (watching Project Runway) while the others visited La Sagrada Familia Church and the Picasso Museum. I’d been to Barcelona before and had seen what I wanted to, so it wasn’t heartbreaking to have to rest and watch TV. For lunch I went to a coffee shop right next to the hotel and had super juicy strawberries (Spain does fruit sooo well), the middle of a sandwich, tea, and ice cream. When some of the group had returned, we got hot chocolate and sat in the lobby, but my back kept getting more and more painful until I decided I needed to see a doctor. The director took me, in taxi, to the place the hotel recommended, which ended up being for worker’s comp only, so we took another taxi to another hospital and checked into the Urgency room. The first bad sign was that they spelled my last name wrong (classic) and we were waiting for 30 minutes despite the board saying there were (0) other people waiting. The doctor finally invited us in, not getting up out of his chair. Him, after rolling his eyes, motioned with one finger for me to turn around and bend over, barely giving any instruction. Him: “There are none.” Leaves the room. The director runs back while I stay with him. Him: grunts, doesn’t change the chair to flat, goes over to the nurse. “Set up (insert drug name because I didn’t hear what it was) to be given intravenously. Him: says them quickly and goes to turn away, meanwhile the nurse is nice enough to write them down. Me: nodding but also crying, because I don’t want to have to do this whole process over and bc I’m in a lot of pain. At this point the doctor has already left the room. The nurse whispers to us that he can have another doctor look at me so ushers us into a back room. The female doctor is incredibly nice, coming up with a similar diagnosis but deciding to inject something locally. She actually answers my questions and is caring. As she goes to get the shot, the male doctor barges in demanding to know why we were talking about malpractice (we weren’t). So he goes on a rant with the director about how great of a doctor he is and how he did everything right despite us saying he had no bedside manner or friendliness. This time we really are leaving because he won’t leave the room, so Im limping down the hall, clinging to the wall so I can walk as he’s still yelling. The female doctor comes back out right then and is, rightfully, mad. She ushers is into a room right next to where we are and closes it, gets the nurse to do the injection, and then we leave, with both of them telling us that we can report him on the way out. We get the form and ask the front desk who the doctor is (since we know the first name) and he says he has to call back to check (which is weird. Shouldn’t he know the doctors that work there?) so we wait until he gets the name and we leave before the doctor can come back out and do who knows what. The program directors are nice enough to take me out to dinner (gf noodles) near the hotel and help me walk back to my room. I go home and sleep and the next day, feeling a lot better after the injection, i hang out in the hotel room while the directors file the report. For lunch I get GF crepes with strawberries and chocolate. For dinner, I go with one of the other students who didn’t go to the nightly flamenco show to get burgers and fries. I sleep most of the way but I definitely feel it in my back that I’ve been sitting an entire plane ride when it’s done. At the vintage store, there was a lot of US sports team apparel which was weird. Given the price it wasn’t worth the novelty either, at least not for us. La Boqueria market- where we got shaped chocolates and looked at a lot of other cool foods. Posters for Carnival- like Halloween but before lent- a chance I guess to sin before repenting? Two cute chocolates from the market- a duck and a hedgehog. Ice cream round 1. Super great for back/any pain. (Not) scientifically proven. Gf crepes with strawberries and chocolate. Pictures from other people on the trip, including Gaudí, the Sagrada Familia Church, and Picasso Museum. Monday was a free showing of Frederico Garcia Lorca’s La Casa de Bernarda Alba at the language center, with optional payments going to benefit kids in Honduras. I had read the play for a Spanish class in college, which was helpful given some of the stronger accents. Afterwards, a few of us went to a language exchange where we met Spanish, Italian, US, and Chinese students. Tuesday was a cooking workshop with some people from our program and Spanish students. We made paella, potato tortilla, cold soup, and what was basically deep fried french toast (a pear for me for dessert, though). Wednesday-Thursday included typical classes. Friday we had an added day to make up for break next week (during which we will be in Barcelona). In my film class we started watching 7 dias de enero (7 days of January) about the week in 1977 when 5 lawyers were killed in their office and 2 students were killed in protests. My politics class consisted of trying not to fall asleep in the warm classroom. Marketing consisted of learning about what “demand” is.. very hard concept. My favorite part is the illustrated homework worksheets in multiple classes. On Thursday, after class, I was walking with a friend to a cafe for tea (our Tuesday/Thursday) when a man, walking in the other direction grabbed my arm forcefully. I had to pull my arm away and we took off down the road, one of the busiest in Granada, during the middle of the day. I was in shock for a bit and stayed home the rest of the afternoon. He didn’t take anything, didn’t say anything. I reported it at the police station after class on Friday and they hopefully should be able to figure out who it is because there are cameras all over the street. (So maybe we’ll figure out more why it happened as well). Saturday we woke up at around 6 to get on a bus to Seville/Sevilla (3-3.5 hours away). We all slept most of the way, sprawling over bus seats, propping ourselves in strange positions. 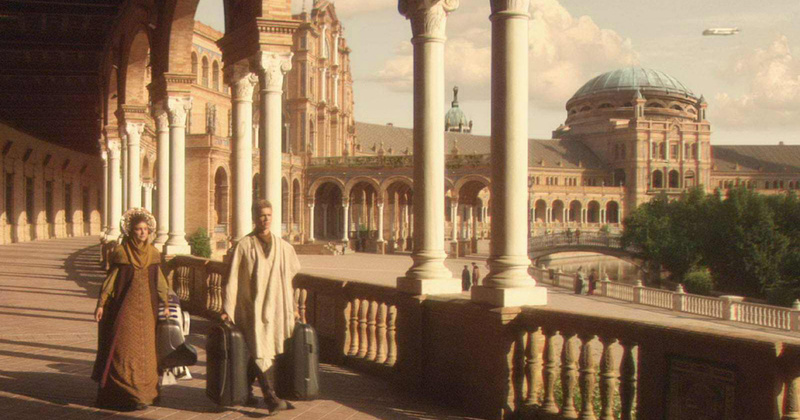 Once there, we started out at the Spain Plaza (for the world’s fair, and Iberian Fair) which also makes a cameo in Star Wars! For lunch, we legitimately had a 5 course meal. Salads. Goat cheese with preserves and balsamic? maybe? Croquetes and/or potato tortilla. Chicken breast and potatoes. Egg rice thingy. Bread (not for me). Cake, or flan-like gelatin for those with allergies. We were all so stuffed and had planned to go to a cool gelato place with weird flavors like goat cheese and quince jelly or corn, but were wayyy too full. (PS I tried quince jelly, and quince fruit, for the first times here and I lovee the former and like the latter). We went in the Cathedral, the largest in the world and went up the bell tower (nicely ramped to accommodate horses in the day). and I even got within two arms length of the balcony (woohoo). After walking along the river and through the town, past horse-drawn carts and souvenir shops and newly-opened gelato stands in the 75 degree heat, we got back on the bus to Granada. On Sunday 24th of February I woke up slightly early to get in the car with my host family (and dog) to go up to the Sierra Nevada and hike in the woods (luckily hike was synonymous with walk in this case). I met another of my host mother’s sisters and her husband and their two dogs (a min pin and westie). When we came back, I fell asleep for half an hour and we had spaghetti. A friend of mine went with me to a cafe for GF banana bread and to work on blog post together. On our way to the Sierra Nevada- here’s a view of one of the the snowy peaks. Some of the group outside the bell tower of Seville’s Cathedral. The hiking woods and pine trees. Short sleeve weather. Neo, the host dog, on one of many sticks he found. The large Seville river. The Guadalquivir. Torre de Oro on the river. Watch tower to defend against Vikings. The shrine for (and including part of) Christopher Columbus. Because he was such a flawless dude. Inside the Cathedral. Brides in the courtyard– the start of wedding season here. In the Spanish plaza, and my face after being stuffed with 6 courses. I had my second week of classes. On Tuesday, we had another Intercambio where we met up with other exchange and Spanish students to go to bars for Tapas. (In Spain, when you get any beverage besides water, you get a free appetizer type plate). The first place was fairly typical- potatoes and eggs. The second, however was amazing. For €2.50 (a little more than $2.50), we got a drink and basically a whole plate of rice and a chicken drumstick. It’s called La Peruana (The Peruvian) and not only was cheap but super tasty. Besides talking more with people in my program, I met a student from Germany who had studied in the US, along with a Spanish student. On Thursday, right after class, I got on a bus to Malaga to fly out to Amsterdam. Another student from my program was on the same bus and flight and a nearby hotel. Unfortunately talking was like pulling teeth, but fortunately, by splitting the taxi, I saved about $25. When I was almost at the hostel, I got a text from Mehra asking where I was. She came to surprise me (especially because it was Valentine’s Day) at the airport but I missed her. Check-in took almost an hour because the group ahead of me had probably 20 people and they were paying one by one. Then, everyone was asleep in the 6-bunk room so I couldn’t find the pillow or comforter. I had my travel pillow and piled clothes on top of me but the next two nights were better once I found them in a bin under the beds. We (Mehra and I) had gf Dutch pancakes for breakfast, gf avocado toast for lunch, salted chocolate gf cake, and gf pizza for dinner. We walked over 11 miles (20,000+ steps) and saw the Fault in our stars bench, the outside of the Anne Frank House and Rijksmusem, the red light district (I guess good that we went but super weird and uncomfy. Also it’s only a street, not a “district” like I was expecting). We also saw the Eye (a modern building that shows movies), the ferry, Mehras apartment (single room with own bathroom, double bed), lots of canals and bikes, and other stuff. It was so cool to see these things, especially after my favorite movie and book, The Fault in Our Stars, and wanting to come here because of it for years. We met a girl from Ireland who was celiac and told us about that best GF food. In my hostel room that night I met a girl from Australia who was traveling around Europe (and the US) for a gap year. We had the (subpar) hostel breakfast together before I met up with Mehra to go to the Moco, the museum of modern art. Banksy was featured, although obviously without his permission. Afterwards, we went to a giant flea market with over 500 venders in a warehouse. We took the ferry to get there (which is free) and met some Canadian abroad students, one located in Amsterdam and one visiting for the weekend (like me) but from France. It was cold and we were tired and the day was getting late as we started towards a restaurant that the Irish girl had recommended when we stumbled on a café in the train station. I had hot, pumpkin-y soup, a GF sandwich with cheese and turkey, hot tea, and a GF merengue cake. So good, especially to warm us up. We continued onto the restaurant we were intending to go to (which was supposed to have good desserts but we were unimpressed by how they looked, so left for another bakery instead). There, I got an almond cupcake with buttercream frosting and chocolate loaf with Carmel drizzle. We ate cupcakes on the side of a canal, watching the boats and ducks and swans. I took a nap at Mehras apartment before we went in search of dinner. The place we were trying to go because they had GF lasagne told us they “were out of food” which is weird because that’s literally their only job to provide sustenance, but oh well. It took us a while of walking to find a place, a sort of bar, where we had burgers. Next we met up with Mehras friends from the same program. All of them were sweet and charming and easy to talk to (take notes, tooth-pulling-conversationalist). That night the people in my hostel room were from Brussels who all spoke French and English. One also spoke Spanish and Chinese. Another Hungarian and one more language. And I thought I was cool for speaking 2. I met up with Mehra and her friends for breakfast the next day- scrambles eggs with Parmesan and truffle oil (yum) tea and hot cocoa (because we were outside and it probably wasn’t outside weather). Mehra took me to the airport so I wouldn’t get lost and we said goodbye 😦 . I slept the entire 3ish hours back, got my bus wrong but the other driver was going to where I was supposed to be so he thankfully drove me there. To top off the trip, when I got home the hot water was broken (luckily fixed in the morning). But I was glad for my own bed, where I had no trouble finding blankets or sheets or sleep. First week of classes done! In addition to marketing/communication and Spanish speaking, I also am taking business Spanish, EU politics, and Spanish/Latin American film. After class some days (before dinner) I go to the semi-sketch gym, get tea with friends, take naps, write, play indoor soccer with my host brother, and so on. I’m still trying to volunteer at a hospital or the Red Cross or something similar but the program directors still haven’t gotten back to me. Some random things that have happened this week: For one, I discovered the wonder of hot milk with cereal (I know what you’re thinking– I was thinking it too). My host mom warmed milk for a minute before putting my GF cornflakes in and wow, I will never go back to cold milk. It soaks in better and enhances the flavor. So good. Try it. Turns out that falling last weekend (off the ramp in the synagogue) not only hurt my pride but sprained my ankle. Its basically better now, but an embarrassing way to get injured. Finally, my host brother is super dramatic and has figured out (he thinks his mom doesn’t know but she does) that in order to get to sleep in her bed while the dad is gone he fakes a tummy ache (which mysteriously disappears when she agrees to let him sleep with her). It’s a good thing he’s cute because I think it makes up for his inability to lie (also not a bad quality). Friday, February 8th I didn’t have class so I went to the gym in the morning before a mandatory program class on diversity and race in Spain. (Basically, especially because of the Franco dictatorship, there isn’t as much diversity in Spain as in the US, and either way it isn’t talked about as much here). I think it was an important topic to discuss but unfortunately wasn’t as deep (or applicable) as I wished it had been. I also went on a preliminary trip to the Albaicin with a friend of mine from the program, where we passed a few churches (including the one my host parents got married in, so cute) and the medieval torture museum? (We didn’t go in. I didn’t realize this was a thing). February 9th we went to the Alhambra, the most visited site in Spain. Technically it’s a city with a wall, although it also refers to the main “castle”. Afterwards, we walked to the Generalife, the summer home of the Alhambra. February 10th we walked through the Albaicin, the old city. There are banuelos (bath houses), teterias (tea shops)– one of which we went to for tea and pastries (including gf chocolate cake), Arabic crafts, etc. We saw the Alhambra this time from outside, old houses from the inside, the banuelo, the tea shop, and more. We happened to pass this medieval torture device museum? Very random, and slightly disturbing. The entrance to the Alhambra! View from one of the Alhambra towers. Another view — of the Sierra Nevada. The Alhambra warning bell– for intruders or attack– alongside the flags of Granada, Andalucia, Spain, and the EU. Intricate, post-renaissance carving on the outside of one of the buildings in the Alhambra city. Looking pool and hedges in a courtyard. The pool and hedges from another angle. Arabic carvings in the doorway and wall. Ceramic tiling and plaster carvings in the palace, an alcove in the Sultan’s room. Another part of the Sultan’s room. Ceiling of the Sultan’s room. The famous courtyard with the fountain of the lions. Two other views of the courtyard and carved arches around it. Two ceilings, all carved out by hand. An orange tree. Many are all over the Alhambra and Granada. The Generalife– summer home of the inhabitants. Group photo at the summer house. An old nobleman’s house. His daughter fell in love with the horse hand, so he killed him and locked his daughter in until he sent her to a convent. More pics of the Alhambra, at sunset. The day began by waking up at 6:30 and walking 20 minutes, taking the bus for 20 more (exactly what we all want to do on a Sunday). The entire program then took a chartered bus (2.5 hours) to Córdoba. Most of us fell asleep. Our first stop was Medina al Zahara, a city built by the caliph of Southern Spain during Islamic rule of the area (~700 AD). The city only lasted about 80 years before being abandoned and repeatedly pillaged. Only 10% of the city remains, almost none of which includes ceilings, decorations, etc. After Medina al Zahara, we drove to the heart of Córdoba. First up, a synagogue (only one of 3 historical ones still in Spain, 2 are in Toledo) and was only kept because the decoration was hidden by walls that were plastered over. Only about as big as an average room, it’s much smaller than most historical sites. Apparently it used to be a hospital for people with hydrophobia? Strange but true. Also this is the prestigious location where I stepped off a ramp without knowing it and fell in front of our whole group and a bunch of tourists. Super fun. Three of the Jewish girls from my program, in front of the menorah. Finally, as per Spanish culture, we had lunch at 2:30 at a Moroccan restaurant. The meal included a fresh salad of cucumber and tomatoes and GF falafels. The entree consisted of yellow rice and soft chicken before dessert- a sort of custard with the texture of coconut but without the coconut taste. On the street, we saw a girl walking her ferret?? After the ferret on-a-leash situation, we crossed this beautiful bridge and passed by a sculpture of the guardian of Cordoba. After 2.5 hours, we finally made it back to Granada. February 4th- First day of classes! I started out with Marketing and Communication. Not only is one of my friends from the program in with me, it seems like it’ll be an interesting class. One of our main projects we can tailor to our interests, using the major themes from the course– anything from theater to books to products to large businesses. My EU politics class got cancelled because the professor did something to his foot, so a few of us got tea and gf banana bread and walked through a Spanish book store. Afterwards, I went home for another yummy lunch (soup, because all of us in the house either were sick, are sick, or are getting sick (ie me)). I went back up to the school (another 30ish minutes walking and by bus) for my last class of the day– Spanish speaking. The professor initially seemed intense but ended up being funny and good at teaching. We already covered a grammar rule, talked about our pets and name origins, and started a list of new words and Spanish idioms. After class, I went back to the gym again. I took a 20 minute bus ride each way to get a book for one of my classes, Spanish and Latin American Film. (Very high quality, comic sans-font, self-printed pages. Definitely worth the trip and 5 euros). We took little Alvaro to soccer practice so he could show us how he was “the best soccer player ever”, just as he is the “best at everything”, which frankly is quite bold for a 7 year old (but I guess he does know everything…). When we had to leave (because practice was over), he pouted for an entire hour about not getting to stay longer. I visited my first Spanish supermarket (Mercadona) which surprisingly had a lot of gluten free foods, including the best gf pizza. (My host mom said this is because the owner’s daughter has celiac disease). Then, my host Mom and dog and I walked to pick up my host brother from school and it was so hot I ended up taking off my jacket (in January) for the mile there, and leaving it off for the mile walk back. My host dad came back from working in a different city for the week and brought the best oranges. Super sweet and juicy, very little pulpy covering. After dinner, the group went to do karaoke in an Irish bar (super Spanish thing to do, I know). Thankfully (for myself and everyone there) this was a spectator event for me only. I took a taxi back home since I left “early” at 1:30 with a driver who said “American?” after I said “Hola” so that was great for my confidence in my pronunciation/accent/Spanish prowess. But oh well. *surprise* I slept in again and after 2:30 lunch met up with friends from the program at a coffee shop to work on applications for summer internships, funding for said internships, blogs (me), and so forth. I played more indoor soccer with my little host brother, worked on “sit” with the dog (or “seeet” as he only understands it with a Spanish accent) and tried to get all the dog hair off of me after he climbed into my lap. I was going to go back to the *luxurious* gym but decided to do yoga in my room instead (as alluring as it was to walk all the way there, in the dark, for such quality). Despite all the very adventurous things in the last few days (ie sleeping, the gym, more sleeping), the only new picture I have is of Neo, the dog, laying in my doorway so I couldn’t close the door and leave him in the hallway. I found out I placed into the level and program I was expecting via the placement test from the previous day (yay). I asked them to look into volunteer opportunities for me to do while in Spain, so we will see what I end up getting to do :). Also waiting to hear on my finalized class schedule, but likely I will be taking (all in Spanish) Spanish speaking, marketing, politics of the EU, Spanish and Latin American film, and Spanish business. (A nice mix of things I normally wouldn’t study in the US, and hopefully will help with my Spanish language and culture skills, as well as expanding my knowledge base). I *finally* got a bus pass, so I didn’t have to walk home for lunch (yum, as per usual). Afterwards, I took the bus back up (yay public transportation) to get more shampoo, etc (all things I didn’t bring full sized bottles, knowing I could get them here). Afterwards, I met up with friends in the program before we started walking back. On the way, we happened to pass stores for other things we were missing (a working straightener for me, contact solution for them, etc). It was cool to see the city at night (peep the Christopher Columbus statue below) and walk by the river and see the street art. All in all, I ended up walking 7 miles in Granada today…. Trip to Nerja/Malaga! (Nerja is a beach town next to Malaga, Spain, on the coast of the Mediterranean). I woke up a little after 7 today, eating breakfast and taking the the city bus up to the bus station to go to Nerja. I met two other friends and we slept (basically the entire) 2 hour bus ride. The mountains were huge as we drove through, around, and on them. I tried to capture a picture to give you an idea of the height, but I couldn’t fit the top and the ground in the frame. Once there, we walked to the beach (pics below), including meeting Hugo (the Westie from England who loves, loves the beach). He flopped on his belly and let us pet him before laying in the sand and digging at the same time. From there, we went to the Balcony of Europe (with a view of the ocean and the statue of King Alfonso– as shown with me below). After walking around, we got used books in a bookstore (mostly in Spanish) and then went to a vegetarian/gluten free cafe (the later for me and the former for my companions). I got GF cheesy pasta and later chocolate and tiramisu gelato. One thing Spain does right, besides all the food ever, is gelato. I’ve never had a flavor I didn’t love. We saw certain monuments (the wonders of Nerja) like a rock from the caves below (pictured) and an old fishing boat (not pictured). We walked around the city some more, stopping before at a cafe for tea before getting back on the bus and sleeping the 2 hours on the way back. I took the bus again back to my host family’s house for dinner. Afterwards, I played soccer with my little host brother (7 years old) and sat with Neo, the dog, who now follows me everywhere.